Are you overwhelmed by social media? Would you like to learn how to use Facebook, Twitter, LinkedIn, Google plus and other online tools more effectively and efficiently in your business or professional environment? Which tools are even right for you? Total beginners to intermediate users of social media will find this course valuable. It’s particularly useful for those who work from home, are a Professional Parent, Small Business Owner, ZZP’r, starters, but is also applicable to not for profit organisations, government, and larger professional organisations. Our trainers have worked with all the above types of organisations and are currently based in The Hague, The Netherlands, but have also lived in other locations around the world. So it’s possible you are from/will have fellow students from places such as Australia, USA, UK and more. See here for a full list of topics. It’s a cliche but we do like the term “in the comfort of your own home”, don’t you? This is an online course, so all you need is internet access and you choose the location. So you can do the course in your PJs if you wish! Or you may choose to study at a local library, at work or elsewhere. 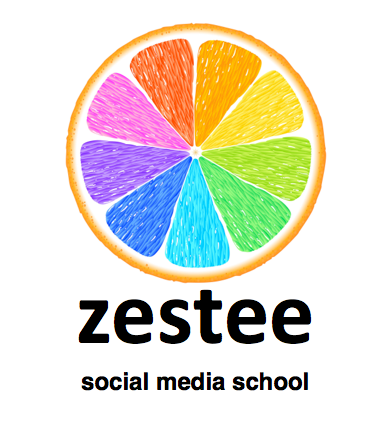 The Zestee Social Media School runs as a 12 week program and it’s highly recommended (and most economical) to follow the whole course. This is flexible and you can decide how long to dedicate each week to your study. We would suggest putting aside at least 2 hours a week, though you may wish to do more. Each Sunday, you will be emailed your lesson plan for that week. You will also be invited to join a private online Facebook group for direct access to your trainer/s and other students. At some point during each week, the trainer/s will be available online for a one hour live chat in the Facebook group. You will receive details on this after signing up. It’s not a problem if the set time doesn’t suit you though – you can catch up by reading through the online conversation later in the week if you wish. You can also ask questions and chat with other students online at any time during the week, with many questions being answered immediately and others taking a little longer but usually within 24 hours. Each module will cover a different social media school topic (click for the full schedule). If you choose to not take the whole course you can pick and mix modules to suit. Interested? We’d love to welcome you to our class! Sign up today via the shop (or feel free to contact us if you have any questions).